CloudFlare is a both a proxy and a CDN (content delivery network). It was recommended to me by Magnus Bråth. Never heard of them? According this recent article on Forbes.com they are getting over 1500 new signups per day and on any given day 25 percent of the Internet’s visitors pass through its network. I have now tested it for about a week and I recommend them. I am using the free version so far and below I will show you my results. The graph below shows that I received around 1000 spam comments per day on this blog (filtered by Akismet) and that CloudFlare cut this down to less than half with the medium security setting. What I really like is that CloudFlare blocks before any request is being sent to the server. The graph below shows that CloudFlare blocks almost half of the hits to this blog. What is blocked is spam bots, they call it "threats". When CloudFlare blocks it displays a CAPTCHA to the user to prove that they are a human. If passed, they are allowed access. So I am not so worried but I don't want to set my security settings to high. Now I have also installed a math challenge plugin to cut the spam down even more. I am hosting static content via my domain staticjw.com. 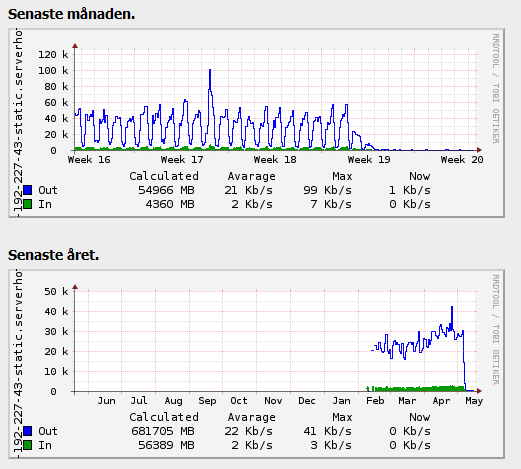 It is hosted by a nginx server in Sweden. The subdomains images.staticjw.com and uploads.staticjw.com are pointing to Amazon S3 buckets in which I host images and uploaded files from users of N.nu. I didn't use a real CDN until now meaning that content from S3 is now loading faster for my users in Sweden and all content loading faster for users outside Sweden. And I did not yet receive any email asking me to upgrade to their Pro version. If you already have optimized your website for speed and you are already using a CDN it might not load so much faster with CloudFlare (like in my case). In fact it can actually in some rare cases load slower if you have a fast server in the same country your visitors are located in and CloudFlare does not have a datacenter in that country. This is due to the extra added latency of around 0,2-0,3 seconds. Also remember that CloudFlare does not cache HTML, only static content. Read more about their speed improvements here. If you have not done speed optimization you have a lot to gain here. If your server or website goes down CloudFlare will keep it up by showing a cached copy of the HTML. Of course if CloudFlare goes down so do you. But I think CloudFlare has a higher uptime than what you are hosting with now unless you use for example Amazon EC2 or a similar high end solution. In order to trigger Always Online, your web server will need to be completely unresponsive, or return a 502 or 504 HTTP error response code. Always Online will not be triggered for other HTTP response codes, such as 500. You can however activate the "I'm Under Attack Mode" any time you want, read more here. CloudFlare provides a very slick and easy to use DNS tool for unlimited number of domains with anycast and fast update of records. This alone is worth the signup for me. You can easy put CloudFlare on and off on a domain or subdomain. If you use WordPress you can simply activate their plugin. Give it a try, it just takes a few minutes and there is nothing to install. If you don't like it you can easily turn it off.